Improving your people skills and becoming a people-person is a surefire route to success, happiness, and confidence. Weíve all looked enviously across the room at that person who seems to effortlessly interact with everyone – humorous, confident and well liked. That person is confident with people they donít know, they have no fear of rejection, they can handle difficult situations with apparent ease. Well now you can too. 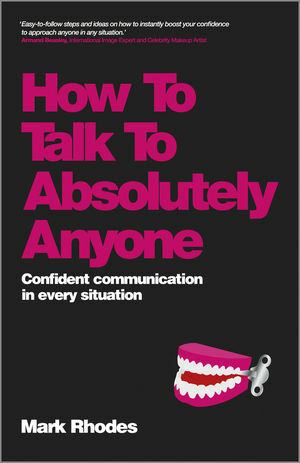 How to Talk to Absolutely Anyone will show you exactly how to develop better communication for better results. With Mark Rhodes sound advice you will be able to build rapport with absolutely anyone. Mark Rhodes made his fortune by setting up a successful software company which he sold in 2001. Since then he has made it his mission to find out exactly how he achieved this success and pass that wisdom onto others. He is now a Business Mentor, International Speaker and Trainer in Success. His clients include top brands such as The Body Shop, Virgin Cosmetics and DK. He has recently been hand-picked to be a 'Millionaire Mentor' for the Entrepreneurs' Business Academy, a joint venture between the EBA and James Caan, ex-Dragons' Den.